Here's a long series of images from Flickr user Leandro Moreira, on a trip from Rio de Janeiro to São Luís via Fortaleza, showing many details of the landscape of eastern Brazil. The series begins in Rio de Janeiro with this image of Paquetá Island in Rio's Guanabara Bay, home of Brazil's only population of baobab trees. 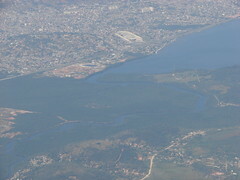 The next image shows the eastern end of Guanabara Bay, with the city of São Gonçalo visible in the upper part of the picture, with the enormous São Gonçalo shopping center in the upper center. 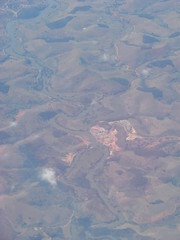 This image shows the eastern portion of São Gonçalo, with the Rio Guaxindiba winding through the lower right. The next image shows a winding path in the mountains just east of the town of Carmo. Just to the north, the next image shows the Paraíba do Sul, the river that forms the border between the Brazilian states of Rio de Janeiro (on the right) and Minas Gerais (on the left). 45 kilomoters to the north, we have this image showing construction underway on the Barra do Braúna, a hydroelectric dam under construction on the Rio Pomba in Minas Gerais. A major construction site is seen on the south (right) side of the river, along with some activity on the north bank. The Google Earth image, dated April 2004, shows no sign of this activity. Further north, this image shows the town of Tumiritinga on the Rio Doce, a river in eastern Minas Gerais. 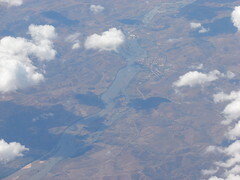 The next image shows a close-up view of islands in the Rio Doce just upstream from the previous image. 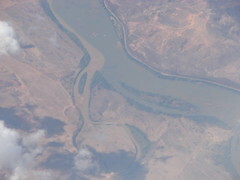 Note the tributary flowing into the river from the lower left, with dark brown sediment clearly visible in both the photograph and the Google Earth image. We now jump about 1,300 kilometers further north, to the Brazilian state of Ceará, and this image of agricultural land just south of the town of Missão Velha. 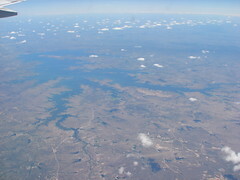 The state of Ceará has several large reservoirs, including this one just south of the town of Quitaiús. 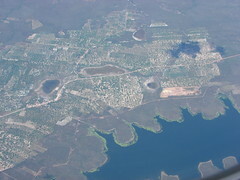 The eastern portion of the reservoir is shown here, with the dam visible just left of center. The water level is noticably higher than the level in the Google Earth image, which was taken in November 2005. 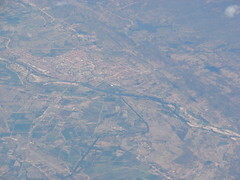 Next we have this image of the city of Icó on the Rio Salgado in Ceará. 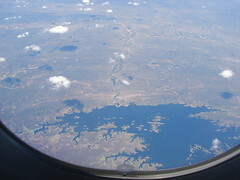 The next image shows the Orós Reservoir, the second-largest reservoir in Ceará. It was constructed in 1960 by damming the Jaguaribe River. 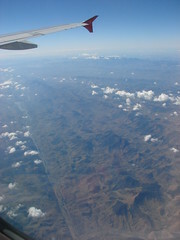 The horseshoe-shaped dam is visible just below the center of the image. The water level here is very close to the Google Earth image, taken in November 2007. 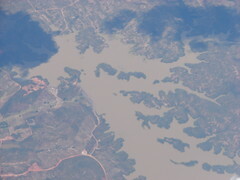 Further downstream on the Jaguaribe River is the Castanhão, the largest reservoir in Ceará. The reservoir began filling after the Castanhão Dam was completed in 2003. The images in the Google Earth view shown here were taken in 2002 and 2003, before the filling of the reservoir, and therefore do not show the reservoir. 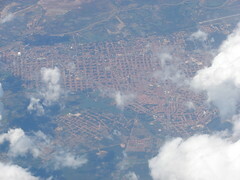 The city of Jaguaretama can be seen in the lower left corner of the image. The next image shows another recently-constructed reservoir in Ceará. 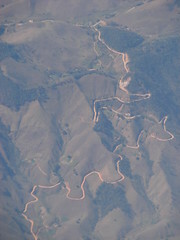 This one is just east of the town of Aracoiaba, and was constructed sometime after the Google Earth image was taken in August, 2004. 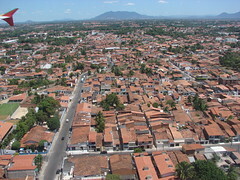 Next we have this view of the town of Acarapé in Ceará. 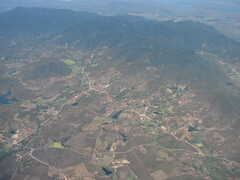 Approaching the city of Fortaleza, the next image shows the western side of the Serra de Aratanha, a mountain park situated between the cities of Maranguabe and Pacatuba. 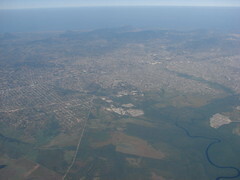 Just before landing in Fortaleza, the final image from this flight segment shows the neighborhood just west of Pinto Martins International Airport. Running vertically on the left side of the photo is the Rua Antônio Fiuza, and in the foreground is the Rua Elcias Lopes. 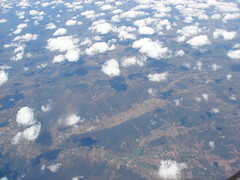 In the background, the mountains of the Serra de Aratanha from the previous image can be seen. 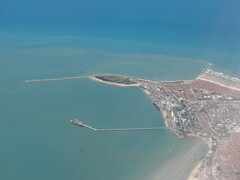 The next flight segment travels from Fortaleza to São Luís, the capital of the state of Maranhão. 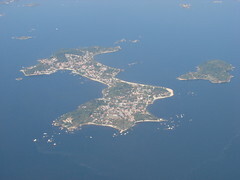 The first image shows the Praia Mansa, which protrudes from the eastern edge of the city. If you look closely, you can see the four large wind turbines which are located in this park. 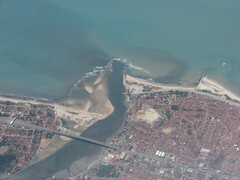 The next image shows the beaches around the mouth of the Rio Ceará at the western edge of the city. 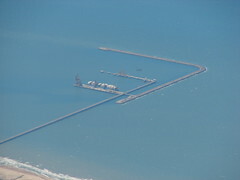 About 30 kilometers west of Fortaleza is the city of Pecém, where the offshore container facility shown here was completed in 2002. 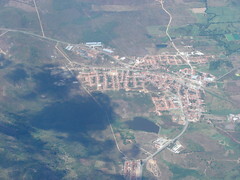 The next image shows the town of Luís Correia, situated in the state of Piauí at the mouth of the eastermost branch of the Parnaíba River. Just west of Luís Correia, the city of Parnaíba sits on main branch of the Parnaíba River. 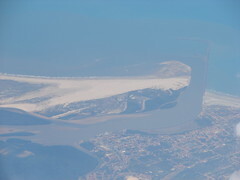 Here's a wider view of Parnaíba, showing the main branch of the Parnaíba River as it reaches the Atlantic. 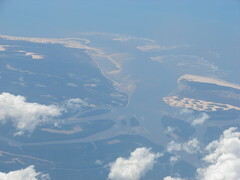 The Parnaíba River has a large and complex delta, spanning over 70 kilometers along the coast of the states of Piauí and Maranhão. 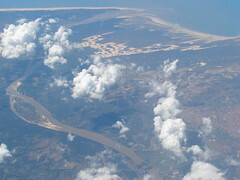 This image shows the main western outlet of the delta, with a small field of dunes visible on the right. 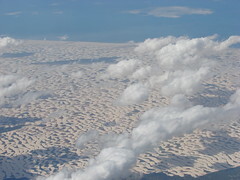 Just east of São Luís lies the much larger field of dunes comprising the Lençóis Maranhenses National Park. The dark sections spread throughout the dune field are freshwater lagoons that form during the rainy season between July and September each year. Here's a closer look at the dunes at the southern edge of the park. The dunes and lagoons are fairly stable, maintaing their shapes from year to year, but slowly evolving over a span of several years. 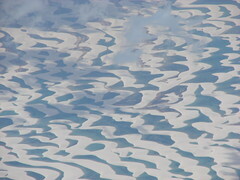 The Google Earth image shown here, taken in October 2003, shows lagoon shapes that match most of the features visible in the photograph, but there have also been substantial changes in the shapes of some of the lagoons.